I arrived back in Kigali to find everyone very busy and very happy. The children are doing well and so are the adults. The tailors have new orders from a Jewish organisation, the jewellers have attended classes and have begun to make paper beads. For now we are looking forward to Karen’s arrival in a couple of weeks and I am pre-occupied with toilets!! I have had an interesting meeting with a teacher at Kigali institute of Science and hopefully we will be able to install eco-toilets if the place is suitable. We shall see and I will keep you posted. Meanwhile, a few pictures for you. 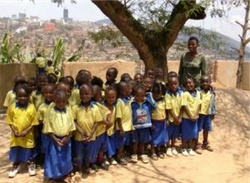 This is Nursery 3, their teacher Evariste and assistant Felicie. 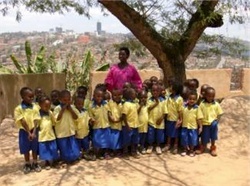 These children have now been attending school for almost 3 years and it is fascinating to see how they are maturing. 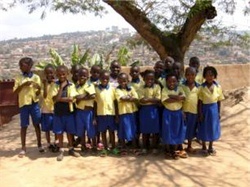 They love school and are doing well. It is good to see. Here is Nursery 2 with their new teacher, Claire, who started as a teaching assistant a year ago. 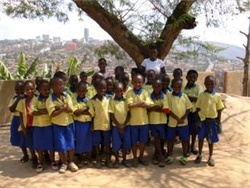 Claire has great potential as a teacher and is attending English classes in the evenings. She is very eager to learn and progress. She replaces Eric who left at the end of last term. And Nursery 1, our new babies who have changed a great deal since they started school in January. Tamar is an excellent teacher, so calm and supportive to the little ones. They love to sing and dance and play with the Lego and other things I have taken for them. 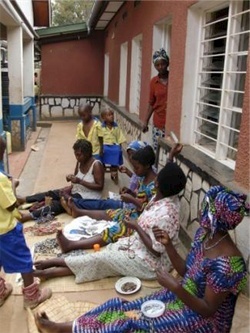 Here are some of the women making paper beads, with Caritas, the lady who taught them, sitting in the foreground. The beads take many patient hours of cutting, rolling, sticking and assembling, but the few I brought home to sell went like hot cakes at our Garden Party, so I will be bringing more home with me in November. I am very happy with the progress of the project, it is both satisfying and humbling to see what the people can achieve and their commitment to making this work is a lesson to all. And Primary 1, a happy bunch! They love to say ‘good morning Meg how are you? 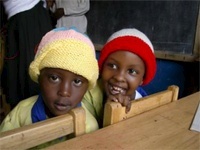 Some smiles from Bahati and her friends, from the tailoring class and from Nursery 2! 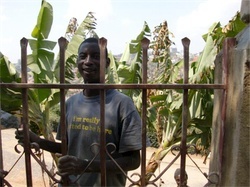 And one of our builders who is finishing off the front boundary wall – he laughed when we told him what it said on his tee-shirt and is happy to share the message with you. It says ‘I am really excited to be here’ Quite!! Thank you, thank you so much for making all this possible. I know I say this often, but we really cannot do anything without your continued support. As always, I wish you all health, happiness and peace.